Last month I wrote that the January JOLTS report reflected very positive trends. Today they got revised away. I pay little attention to “job openings,” which can simply reflect that companies trolling for resumes, or looking for the perfect, cheap candidate, and concentrate on the hard data of hiring, firing, quits and layoffs. The first important relationship in the data is that historically, hiring leads firing. While the one big shortcoming of this report is that it has only covered one full business cycle, during that time hires have peaked and troughed before separations. The updated graph shows hiring exceeding its prior peak in the second halfof 2017 with its last monthly peak in October. Significantly, hiring for the previous month was revised downward below this peak. Meanwhile separations actually peaked before then, in July of last year, with a clear downtrend since, another significant revision since last month. *if* both have made their expansion highs, needless to say that would be important. 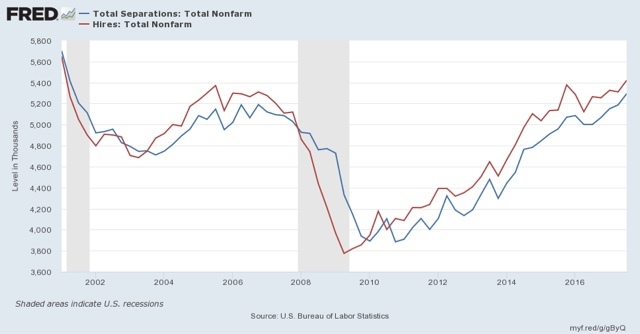 If we have established the expansion peaks in hiring and total separations, I would expect quits to continue to improve for a short while (as they have) before also beginning to decline. As in the last expansion, separations appear to have bottomed.